Seabees assigned to the Naval Mobile Construction Battalion (NMCB) 3, Construction Civic Action Detail (CCAD) Palawan and local school and government officials of Aborlan town celebrated recently the completion of a two-room schoolhouse for the Magsaysay School. The ribbon-cutting ceremony was held on February 6, 2019, a news story released by the Seabee Online on Wednesday said. NMCB-3 Seabees partnered with the Philippine Navy Seabees assigned to the second NMCB to build the schoolhouse in order to provide relief to the overcrowded classrooms that the students currently attend. The classrooms were built to accommodate the typical class size of 40 students with enough windows and high flow fans to ensure that the temperature stays comfortable for the students throughout the school day. Roque F. Badenas, principal of the school in Aborlan expressed his appreciation of the quality of construction the Seabees provided. “The building has been built sturdy enough to withstand the storms prevalent on the island long enough to serve the grandchildren of its first students,” Badenas was quoted in the news story. Constructing the schoolhouse was more challenging than similar projects due to the initial state of the land it was to be built on. Once the land was cleared for building the foundational pad, it was discovered that the ground was swampland with groundwater present from ground-level and penetrated four-feet down. 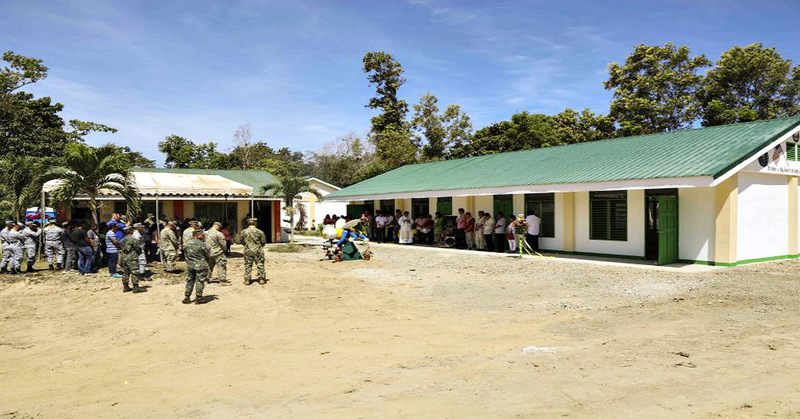 With the combined expertise of NMCB-3 Seabees and their Philippine counterparts, the group was able to work hand-in-hand to overcome the challenge and construct the schoolhouse to serve generations to come. “Despite several setbacks, the crew worked hard; and with their dedicated resolve they were able to overcome the obstacles and were able to complete the school on time and under budget,” said Lt. J.G. Curtis Weis, the officer in charge of NMCB-3, CCAD Palawan. CCADs are small detachments of personnel that are placed in areas of need throughout the NMCB’s area of operations. The CCAD’s mission is to execute engineering civic assistance projects, conduct formal training with the host nation and perform community relations event to help enhance shared capabilities and improve the country’s social welfare. Being part of a CCAD is a unique work environment that appeals to many Seabees for the ability to work with allied nations, give back to communities, and learn more out of rate skills. “The small number of Seabees assigned to a CCAD creates camaraderie amongst everyone involved so that when there were challenges with the construction of the schoolhouse it brought the team closer together, and therefore the challenges were able to be overcome,” said steelworker construction man apprentice Kalub Walker. “It also creates an environment where everyone becomes more well rounded by gaining a basic knowledge of the other Seabees’ rates,” he added. CCAD Palawan Seabees have broken ground on an identical schoolhouse 1.5 hours southwest of the first schoolhouse location. This location will provide numerous challenges to the CCAD due to the travel time it takes to get to the site and its lack of amenities and infrastructure around the site, but it will serve as an opportunity for the Seabees to further demonstrate their skills and interoperability with their counterparts. NMCB-3 is forward deployed throughout the Indo-Pacific region and the United States ready to support major combat operations, theater security, humanitarian assistance and disaster relief operations. Seabees provide general engineering and civil support to Navy, Marine Corps and joint operational forces globally.